To promote its Celebrate the Century series of stamps commemorating highlights of the past 100 years, the U.S. 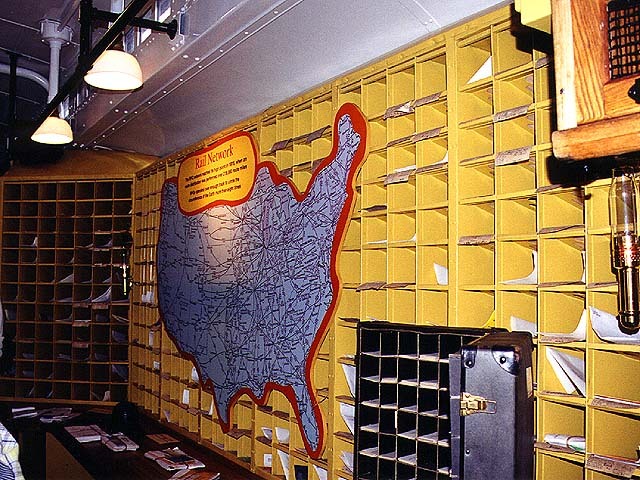 Postal Service created a rolling history display and sent it on a two-year tour of the nation. 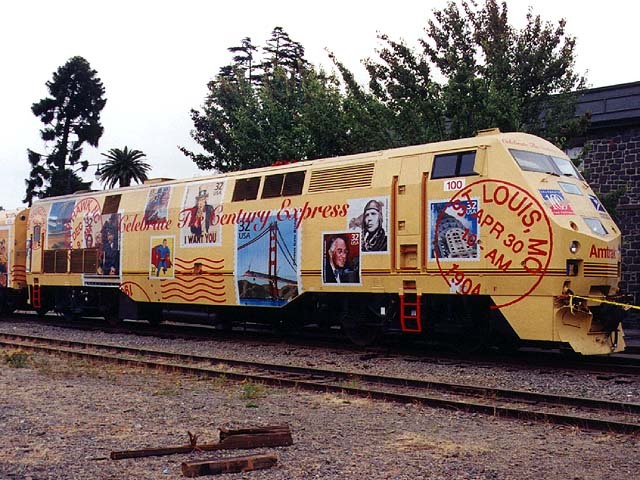 The colorful train -- appropriately powered by Amtrak 100 -- comprises four cars and a P-42 Genesis locomotive painted to resemble a giant parcel. The design features a number of the stamps included in the Celebrate the Century series. 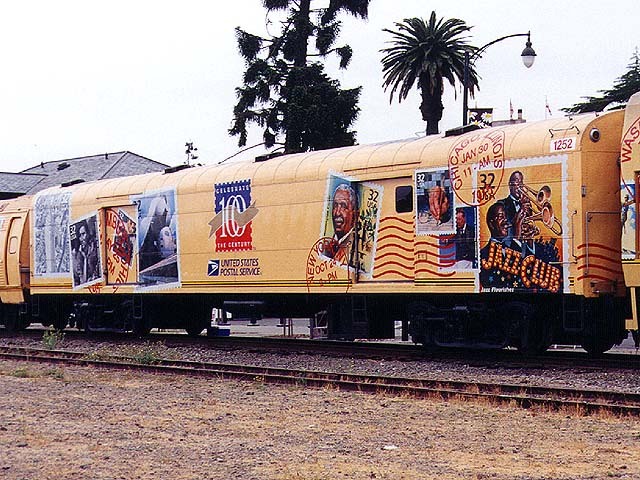 We caught up with the train in Santa Rosa, Calif., on Aug. 7, 1999. As fate would have it, it was a cold and drizzly morning somewhat uncharacteristic of the balmy summers northern California is accustomed to. This did not hinder the crowd, however, as hundreds flocked to Santa Rosa's Railroad Square for a glimpse inside the historic train. Here we see the entire train as it sits on display outside the Northwestern Pacific depot. This was the only angle worth photographing, as trees near the passenger platform blocked the view from the other side. Photo by Roni Gehlke. A closeup of the baggage car, which inside contains a number of stamp displays. It looks sort of like a ginat manilla envelope, doesn't it? Photo by Roni Gehlke. Now we move in closer for a better look at the locomotive. We are shooting from behind a line of caution tape with several other fans, and a determined security guard is keeping a close watch on all of us to make sure no one attempts to sneak into the NWP yard for a better angle. We're not quite sure what he is guarding, as the NWP has been shut down for months and the yard is all but deserted. Photo by Roni Gehlke. Another view of the AMTK 100. 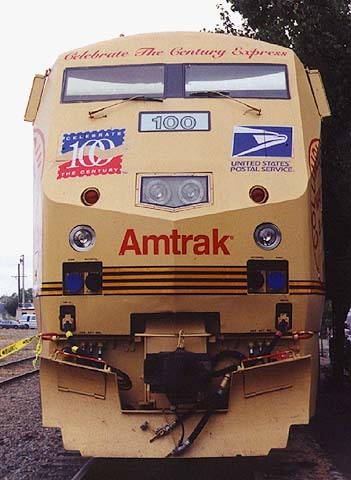 The longer we lingered the more we found ourselves appreciating the familiar red-white-and-blue scheme Amtrak originally assigned this locomotive. The Celebrate the Century look is... shall we say, a little gawdy? Photo by Roni Gehlke. A head-on confrontation with AMTK 100. Man, are my eyes hurting. Photo by Roni Gehlke. Did we mention that the CTC paint scheme was a bit gawdy? 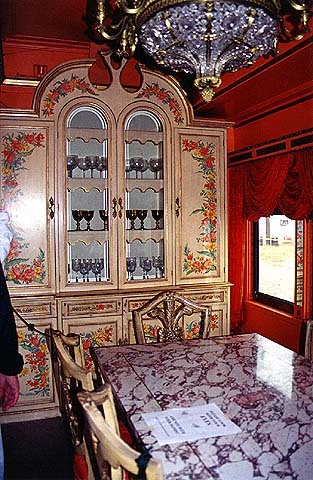 Well, it is tame in contrast with this red velvet dining room that comes complete with a marble table, ornately detailed china cupboard and crystal chandelier. There is quite a line behind us, so there is little time to linger over displays, let alone take photos. This room was part of a 1920s-era business car. Photo by Roni Gehlke. The Railway Post Office (RPO) car was a staple on railroads for much of the 20th century. Traveling mail handlers sorted the letters and parcels collected at various stations along the line and ferried them on their way. This car was filled with cubby holes just like those seen here. 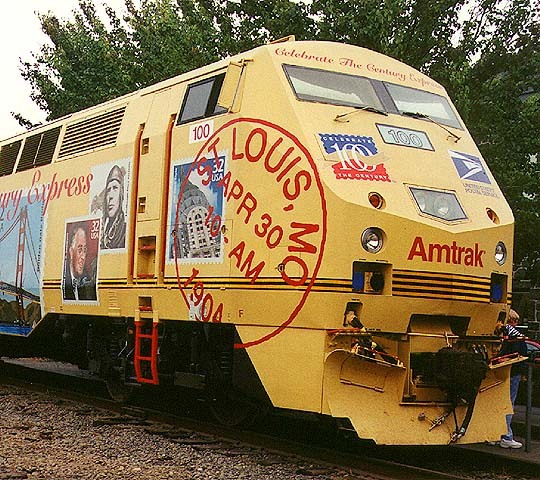 A video presentation describes how trains collected and handled the mail. Photo by Roni Gehlke. 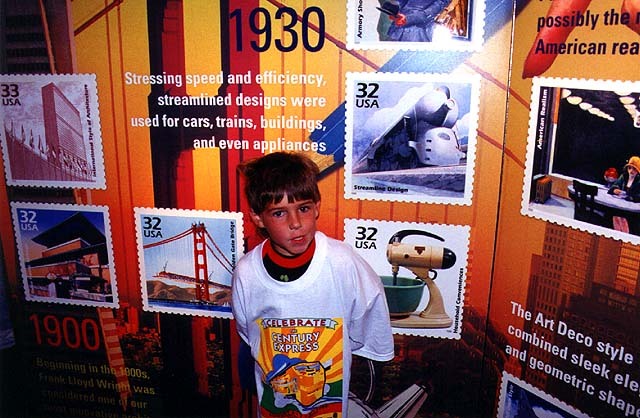 Our son Benji gets into the stamp display inside the Amtrak baggage car. 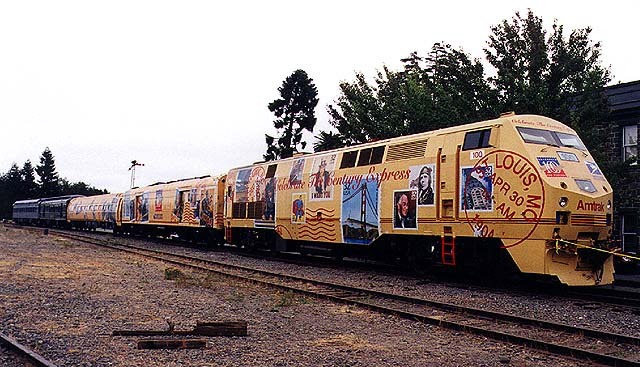 Large artistic panels throughout the car contained enlarged images of the stamps in the Celebrate the Century series and a brief synopsis of each 20th century decade they represent. As new stamps are added to the series during the train's tour of the nation, this display is updated. Photo by Roni Gehlke. 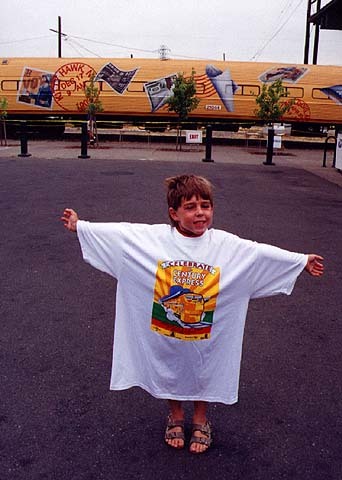 Benji models a souvenir T-shirt in front of one of the CTC coaches. The shirt was actually an adult X-large purchased for Glenn, but because the weather caught us off guard and Benji had only worn shorts, we let him wear the shirt to keep his legs warm. There were dozens of souvenir items available, and we stocked up on postcards, pins and special stamp cancellations. Photo by Roni Gehlke. This page was last updated Wednesday, September 22, 1999 at 00:50 hrs.